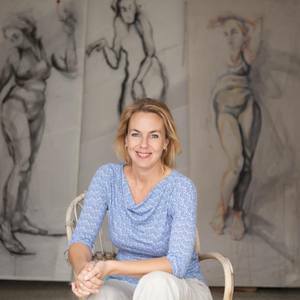 www.koetziervanhooff.eu "Inge studied at the Utrecht Art School and she studied Cultural Anthropology at the Amsterdam University. She recently moved to Holland after having lived in Spain for 10 years. Her travels have provided the perfect background for the expression of her twin passions, people & art. Travelling around she is always training the eye, observing, and concentrating on people in their various environments. Inge sees something remarkable in everyone. She knows how to show the characteristics of a person by painting or drawing just the necessary essential elements and letting the model, the hands and feet, posture, or movement of the body speak for itself. Painting in a sober palette and in transparant layers, in combination with the use of wooden panels or old sails as her canvas is an integral part of Inge's recognisable style. The drawings (nowadays also made on the iPad) show her ability to get the most important elements, often by not showing parts at all. Her work has been acquired by museums and private collections and has been exhibited widely at various artvenues and events. Inge also works to commission, in particular making portraits of children, elderly and animals. She teaches drawing classes and organizes model drawing sessions." - Exhibitions and art venues in Holland and Spain. - Live Model Drawing sessions / Art Café / Drink&Draw / Art Classes in studio and on location in Holland and Lanzarote.